Our vision is to foster a progressive learning environment that helps all our students graduate as mature, confident young people who have the know-how and drive to achieve success in their chosen fields. Please contact us by email if you would like to arrange an appointment to discuss enrolment. Alternatively please feel free to call us on 09 838 9085. 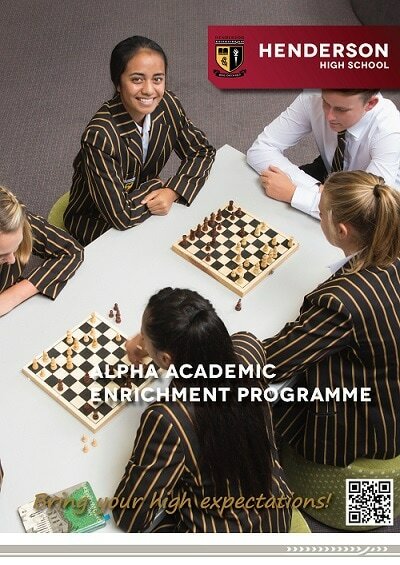 The Alpha Academic Enrichment Programme supports fast-paced, advanced learning to develop students’ thinking skills and extends their knowledge of their chosen courses of study. The programme facilitates research and information gathering using a variety of methods. Students collaborate with schools and academic institutes outside of the classroom environment, in order to enrich the learning experience. Assessment for admission into the Alpha Programme takes place in August in the year prior to entry at Year 9. We offer a range of financial scholarships to incoming Year 9 students who excel in their chosen field. All scholarships cover payment of school fees and include a free uniform. Scholarships for each field also offer specific rewards to successful students. Students are identified and selected in specialist fields to develop high performance and excel in these fields through intense expert coaching and tuition. All pages on this website © 2019 Henderson High School.